The School Games are a fantastic sporting celebration for all young people in the two counties. Pupils from primary, secondary, independent and special schools – both able bodied and disabled – compete in this large scale multi-sport event. Around 1600 young people from almost 60 different schools engage with the 2 main festival events, with more attending stand-alone events throughout the year. The event invites spectators and local dignitaries and VIPs to share the experience alongside young people. At each School Games we have a Sporting Champion to share their inspirational stories with participants and young leaders involved in the day. We have often welcomed Olympic & Paralympic Medalists, including Laura Deas (PyeongChang 2018 bronze medallist) and Sascha Kindred CBE (7 x Paralympic champion). 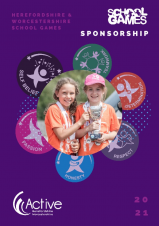 Following the success of the School Games programme, the Sports Partnership Herefordshire and Worcestershire is offering local businesses the opportunity to be part of this event. Your support will help increase sporting opportunities for young people throughout Herefordshire and Worcestershire. For more information, please download the sponsorship brief below, or contact Sarah Mackay.